Raising a child with additional needs is financially expensive. There’s no getting away from it. Be it the additional laundry costs, equipment, adaptations, loss of earnings, the costs just keep increasing. Although the day to day running costs are increased there are a number of charities which can help with one off larger items. For example; Family Fund have provided Dylan with his IPad twice. This is not greedy or extravagant that Dylan has had 2 iPads, in fact due to their delicate technological nature and Dylan’s sensory seeking rough handling we are currently on our 6th IPad. It’s true that the rate at which we are getting through them has slowed significantly as the years have gone by and Dylan’s matured but that’s still A LOT of technology! IPads have paid a large part of Dylan’s development. He naturally picked one up and found it easy to use. He has struggled with puzzles, blocks and other preschool toys but with the IPad he is a natural! Dylan has a statement of educational need. This is a legal document which means that Dylan’s additional needs to be able to access education have been acknowledged and legally assistance has to be provided to meet this need. In real life those professionals assessing the need provide the provision so if they don’t provide it as standard they won’t assess for it. ABA isn’t provided by our local authority so they don’t provide it, no matter how well it works! ABA isn’t expensive in the grand scale of special education. To put it in proportion, Dylan’s home ABA programme used for his learning costs £8000 a year. That’s for 52 weeks of the year. Dylan’s primary school placement with incurred costs of transport and other overheads cost £15000 for 32 weeks a year that works out to over £24k a year over the full 12 months. The costs would be higher for a secondary placement. Just goes to show ABA isn’t an expensive alternative. Caudwell Children help Dylan once a year with a grant to go towards his ABA consultancy fees. This means tested assistance is paid directly to Dylan’s consultant who reduces the pressure on us to provide his education AND pay for it fully. Last April Mark ran the London Marathon and raised £1600 for Caudwell Children. It was Caudwell Children who gave us the initial funding to get the ABA set up, an outlay which we would never have been able to do without their financial support. That was 5 years ago and we have been lucky enough to have their support every year so far. It was important to give something back – Josh ran a 5k run in 2015 and raised £700 for them, last year was Marks turn; both times they added the sponsorship money to Dylan’s account with them to directly pay for his therapy. In my experience it’s these smaller, lesser known charities which provide direct help to those with autism and their families. For example everyone knows the National Autistic Society (NAS); a nationwide charity with a handful of specialist independent schools, the NAS is often considered the benchmark for highlighting autism expertise, advice and advocacy across the UK. As a family we have had little input from the charity. There was no support throughout the diagnosis process or afterwards despite constant efforts to try and access some. Education advice is minimal and there is no support or information given to parents regarding any therapies or interventions which may assist those living with autism or their families. In fact the approach used to describe situations and feeling of those with autism and their families is nothing less than destructive in the efforts of people to try and promote awareness and understanding of people’s differences. An example of this is last year’s NAS campaign ‘the twelve days of autistic Christmas’ describing Lucca a young boy with autism, and his family at Christmas time. Let me tell you about our Christmas. Our family Christmas where autism is understood and integrated instead of being squished into an uncomfortable set of formalities and rituals. As soon as it hits November, Christmas will already start creeping into our house. Dylan loves the noisy singing Christmas decorations that flap and sing and repeat. You know the ones; really loud! He will select his favourite for this year and plays it throughout the day. He loves the endless food and the constant stream of tea and biscuits whilst snuggling under blankets on the sofa watching Christmas movies. No he’s not keen on visiting or having people over; so we don’t. Dylan doesn’t like the look of some decorations; so we don’t have them all out. 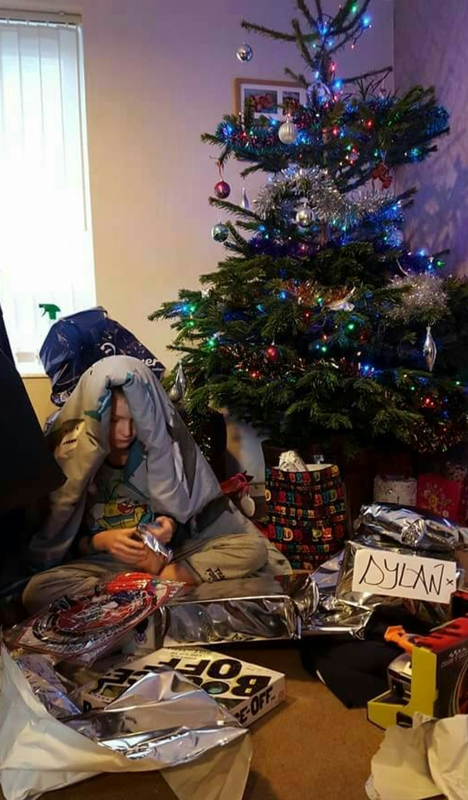 In fact as a family we see Christmas as a time for us all to be together comfortably and Dylan really enjoys that. ‘The Twelve days of Autistic Christmas’ NAS campaign is a slur on the beauty of *our* Christmas. This campaign takes advantage of Christmas being a time where we ALL get a bit tired of relatives, of too much food, the decorations and excitement- that feeling we all get but somehow it tries to make it into an AUTISM problem. Bearing in mind the NAS website motto is; “Until Everyone Understands” I feel the stance on an autistic Christmas is gloomy, promotes negative judgement and is not offering any understanding to those with autism that find situations difficult around the Christmas festivities. Christmas should be an opportunity for families to come together, to understand one another and as a leading charity they should be making efforts to facilitate this. It is not an opportunity make money from the fear so many have that we somehow can’t manage our children or relatives with autism and so we have to face the prospect of doing so with dread or despair. The NAS has a prime role in raising awareness of Autism within mainstream communities – it’s such a shame that it is so negative and poorly represented. Mark ran his first marathon in 2008 and has raised over £14000 in total in sponsorship for the NAS. We then became aware of Caudwell Children and other smaller charities who actually give practical advice and assistance to children with autism and their families. As a family we are very grateful for autism charities and the help they have given Dylan. Where someone wishes to contribute or support an organisation I urge everyone to seek out smaller, more local charities that can benefit those with autism in your local areas. These are often better equipped to make a direct difference to people within autism communities who need support.